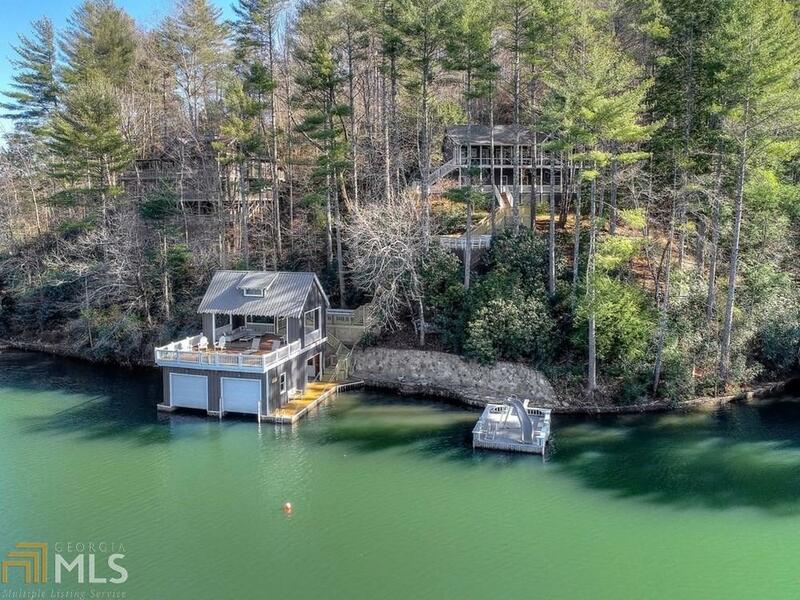 Mountain and big water views on Lake Rabun. Completely renovated and new boat house. This home has 4 bedrooms, 3 baths. First floor features master and guest on main, open kitchen, living and dining. All with views of the lake and opens to screen porch. Lower level is an entertainer&apos;s delight! Wonderful bar area custom wood wall and shelves with rec room, large bunk room that will accommodate 3-6 beds, and bath. Lower level all opens to covered deck. New boat house with 2 boat lifts and sun deck, with covered deck above. Lots of storage for the water toys. Shoreline will store wall terrace and water slide. Wonderful Lake Rabun Retreat! Directions: 85 To 985, Changes To 441/23. Go Past Tallulah Fall. 1.8 Miles Left On Old 441 Toward Lakemont, 2.5 Miles To Left On Shady Lane, Left On Brandon Mill, 4 Miles To Enfield On Right. House On Left.